The ecosystem services concept has seen an impressive increase in use across many disciplines and sectors in recent years. For a concept used so widely, we came to ask ourselves what the core of the concept was and if there was a common understanding among researchers of what it stood for and how to apply it. In our article “Identifying Five Different Perspectives on the Ecosystem Services Concept Using Q Methodology“, we describe the analysis of different perspectives on the Ecosystem Services concept held by 33 different researchers in the OPERAs project. The article was published Open Access in the journal Ecological Economics, so it is freely available for all to access. Through a mix of a qualitative approach using Qsorts – the sorting of statements from the literature on ecosystem services by study participants – and a quantitative analysis through the statistical program R, we were able to identify five different perspectives on the ES concept. We labeled these perspectives: “Non-economic Utilitarian”, “Critical Idealist”, “Anti-Utilitarian”, “Methodologist”, and “Moderate Economist” (Table 1). 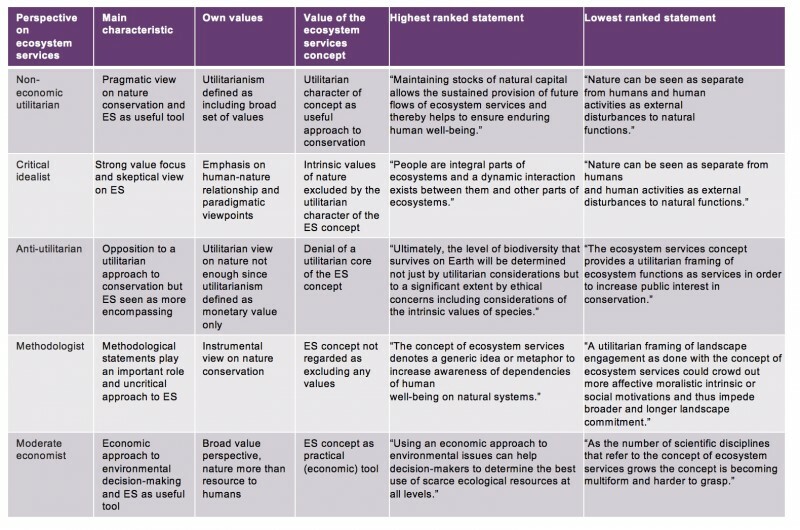 As the labels suggest, the main difference between perspectives we found to lie in value-based assumptions such as nature having an intrinsic value (or not), nature management being utilitarian (or not), or the benefits (or drawbacks) of placing a monetary value on nature. We thus were able to clearly identify differences in perspectives on the ecosystem services concept held by researchers in the same project. What are the implications for applying the concept in practice? Our findings did not lead us to the conclusion that the definition of the concept should be standardized or that standardization would be desirable in the first place. Instead, as we saw both from the literature and from interviews with study participants, pluralism in perspectives is beneficial. A diversity of perspectives on ecosystem services can allow it to serve as a “boundary object,” with an intentionally vague core allowing successful collaboration between stakeholders with different backgrounds and interests. However, what we identified as a potential barrier to successful collaboration were implicit differences in understanding and assumptions. In order to promote pluralism, we suggest a deliberative practice in handling and working with concepts such as ecosystem services that are value-laden and potentially contested. Through open discussions where assumptions and views are explicitly shared, diverse perspectives can be seen as an opportunity rather than a barrier. Based on discussions and deliberations among those using and applying ecosystem services, the concept can serve as a meaningful boundary object for ecosystem management. Table 1. Overview of the five perspectives on ecosystem services identified within the OPERAs research consortium, based on factor analysis of how 33 participants sorted 39 statements ecosystem services from the literature. Shown here are the statements that each perspective ranked „most“ and „least like how I think.“ See Hermelingmeier and Nicholas (2017) for full list of statements and their sources.